The former chief strategist for Donald Trump, Steve Bannon, discusses what he thinks about the Justice Department and Special Counsel investigation into Russia’s hacking of the 2016 U.S. presidential election, including potential coordination with Donald Trump’s campaign. He also responds to questions about his beliefs regarding immigration and trade, and reflects upon his time working closely to the seat of the power in the White House. From Rome, Mr. Bannon spoke exclusively with CNN’s Fareed Zakaria. The Steve Bannon Interview will encore at 1:00am EDT / 10:00pm PDT on CNN/U.S. 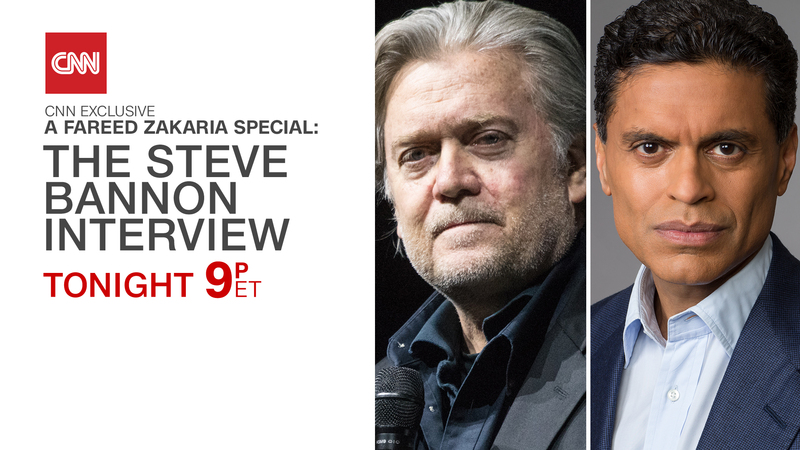 During the June 1, 2018, premiere on CNN and CNN International, A Fareed Zakaria Special: The Steve Bannon Interview will stream live for subscribers via CNNgo (www.CNN.com/go and via CNNgo apps for AppleTV, Roku, Amazon Fire, Samsung Smart TV, and Android TV) and on the CNN mobile apps for iOS and Android in North America. The special will also be available on demand via cable/satellite systems, CNNgo platforms, and CNN mobile apps, in North America, beginning Monday, June 4, 2018. This special will encore on CNN/U.S. on Sunday, June 3 at 10:00am and 1:00pm EDT. Please visit the following for airtimes in specific geographical regions: Europe, Asia, and The Americas.